Some gym equipment comes and goes as fashionable or convenient to the user. Other gear just turns up one day, and then you wonder how you ever got along without it. It’s beginning to look like a solid bet that wearable technology for the gym is here to stay, and it soon might be indispensable too. The Wearables.com website has just posted an exciting article about the wearable tech in use at the Orangetheory chain of gyms. It is an excellent example of how wearables and fitness make such a great pair. This class-based exercise sweatshop uses feedback to encourage, inspire and badger members into putting in their best performances. Orangetheory uses sensors to monitor heart rate during group workout sessions, with the goal of staying within the most beneficial parameters. It is a transparent environment where you have to keep moving to avoid the embarrassment of coming in last on the leaderboard that posts members statistics. What Orangetheory does is simple in principle and powerful in practice; they mix technology and social pressure to supercharge the workout that members get, which makes customers stronger, which, hopefully, drives word of mouth advertising. Wearable tech holds members to account for their workouts. I think that we’ve all been there, trainers and members alike, you go through the motions of an exercise routine because it’s a habit, or you’re bored with the routine but haven’t realized how desperately you need to change it. When a trainer is watching and recording what you do, you perform better, right? In your role as a coach, you may have noticed that just taking a client aside and pointing out how weak their workouts are; they tend to straighten up and do better workouts; they also appreciate the fact that you called them out. Wearable tech does the same thing; it gives you the facts about your workout, and you have to respond by raising your game or admitting defeat. Members of systems that post results for everyone get the benefit of social pressure to keep them on track. So you’re offering an added value when you can capture information and display it. At the same time, your gym has the benefit of information about the way that members use your gym; it contributes to your analytics. How will the future look? You will be able to control access with wearables that respond to beacons located in the gym; that is already changing the way that events and exhibitions are operating. You would be able to track who is in the gym and what part of the floor gets the most traffic. Information like that is priceless! Fitness is part of the retail space, and gyms will change in line with what is going on in the rest of retail. The growing emphasis on experience will shape the way that the fitness business evolves and exploits new technology; in turn, the technology will change as development follows customer demand. Smartphones can already do this, either by apps interacting with beacons or through Near Field Communications (NFC) antennae built into the most recent models of smartphones. If you can gather data about traffic patterns on your gym floor, you can change your layout or add more classes as you see fit. Beacons and NFC have the potential to achieve the same results as connected gym equipment, without the cost of investing in new (and expensive) exercise machines. Applications and hardware are going to evolve very quickly in the next few months and years; innovations will come and go, and the best you can hope to do is balance the benefits you gain against the investment that you make. You will soon be able to access the information that your gym members collect on their wearables, and there will be a host of new opportunities that spring up based on all of the disruptions that go with that. Your business lives and dies by the choices you make, and you make better choices if you know more about what how your members behave and what they want. It is going to be a balancing act of trying as much as you can and running with what sticks. 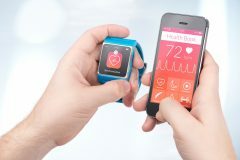 No doubt, there will soon be something that grows out of the consumer technologies such as wearables, which leads to permanent changes in the fitness industry. Fagan, Lawrence. Charity Events By Orangetheory Prove My Point. September 28, 2015. https://blog.gyminsight.com/3500-charity-events-by-orangetheory-prove-my-point/ (accessed October 4, 2015). —. Survey Says Wearable Tech Is Key. November 30, 2015. http://blog.gyminsight.com/3529-survey-says-wearable-tech-is-key/ (accessed March 17, 2016). McConnell, Belinda. Wearables: The Impact On Retail. July 20, 2015. http://www.deloittedigital.com/us/blog/wearables-the-impact-on-retail (accessed August 27, 2016). Smith, Chris. How wearable tech will become the heartbeat of the modern gym. August 16, 2016. http://www.wareable.com/wearable-tech/wearable-tech-in-the-gym-3089 (accessed August 26, 2016). It is actually true that wearable technology is increasing peoples awareness about fitness. I personally have realized that wearing a fitness tracker takes me to power mode in the gym. We have had the same experience with fitness trackers in the gym! Introduction of wearable technology into the fitness regime is definitely going to change the life of people. Nice article and keep posting.